(0 Customer Reviews) | Write Review 6 issues per year Love ancient Egypt? 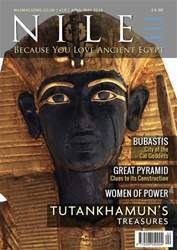 Nile Magazine makes it easy for you to discover the best of ancient Egypt today. Nile is refreshingly smart, bright, and pops with amazing photography! “Just read Nile cover to cover. So easy to read and loads of facts I didn’t know. Excellent.” - Clare Whittam, Manchester. Nile Magazine is your bi-monthly treat for the ancient Egypt enthusiast. Each issue brings you a rich blend of stories covering Egypt’s history, art, archaeology and mythology. There is news on recent archaeological discoveries and current museum exhibitions around the world. At Nile Magazine, we think, talk, love and breathe ancient Egypt, and because Nile Magazine is now available as an app, the land of the pharaohs is closer to you than ever before. If you love ancient Egypt, you'll love every issue of Nile Magazine. Enjoy your Nile time! Tutankhamun's Treasures. A close look at some of the stunning pieces from Tutankhamun’s tomb. Women of Power and Influence. Royal women who shaped ancient Egypt's history. Queens of Egypt. A new National Geographic exhibition that showcases Egypt's powerful women. A New Queen. The owner of an anonymous pyramid turns out to be a previously unknown queen! Bubastis. The history and development of the main cult centre of the cat goddess Bastet. Hatnub. A discovery that could offer clues to how the Great Pyramid was constructed. Marsh Birds of the Gods. The magical waterbirds that inhabited Egypt’s marshes. Plus... the Nile Crossword and lots more! Love ancient Egypt? Nile Magazine makes it easy for you to discover the best of ancient Egypt today. Nile is refreshingly smart, bright, and pops with amazing photography! You'll receive 6 issues during a 1 year Nile Magazine magazine subscription. You'll receive 6 issues during a 1 year Nile Magazine magazine print subscription.